Looking cute and posing for the camera! 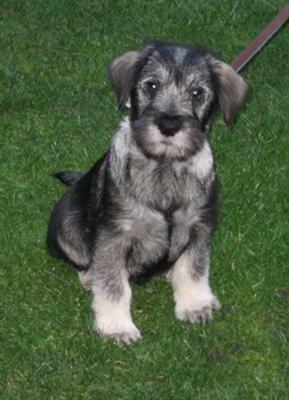 How lovely to see the picture of your Standard Schnauzer puppy - or just Schnauzers as they are called here in the UK, being the original ones! Wilson really has got a serious look on his face and he's staring right into the camera like he's wondering what to do next. I wonder what is going on in his head? Standard Schnauzers are the least common of the 3 types of Schnauzer, yet they are super dogs. If we get another schnauzer I think it will be a Standard, they have excellent temperaments and are a good medium-sized dog. Not to mention they don't shed. I hope you are very happy with Wilson. Some of the standards get really long breards, how about sending us another photo when he is a bit older?